After her first few test-filled days, we discovered that she had suffered a massive stroke shortly before she was born. 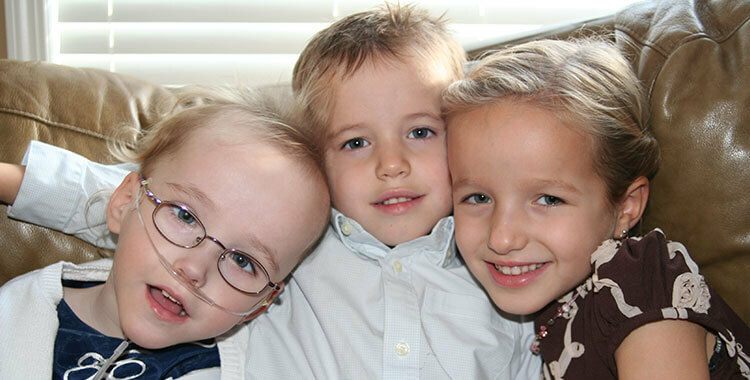 In January of 2008, we eagerly awaited the arrival of our third child. The pregnancy had been healthy and uneventful, but two days before our daughter was born, I noticed a change in fetal movement and became very anxious. When we went to the hospital both she and I were in distress and the doctors performed an emergency C-section. At the urging of the caring staff who feared her time with us would be short, we quickly agreed on a name for our daughter, Clare Denise. The day blurred with activity as she was transferred from the special care nursery at the Rockyview Hospital to the neonatal intensive care unit at the Foothills where the doctors and nurses were better able to treat her life threatening medical conditions. After her first few test-filled days, we discovered that she had suffered a massive stroke shortly before she was born. It had destroyed the majority of the left side of her brain and would make many things difficult or even impossible for her: movement, speech, vision, hearing, even eating and swallowing. There was a period of slow stabilization in the following weeks and a month after she was born we transferred to the Alberta Children’s Hospital. There her days were filled with more tests, therapy and daily debridement to maximize healing of the large wound on her right arm. 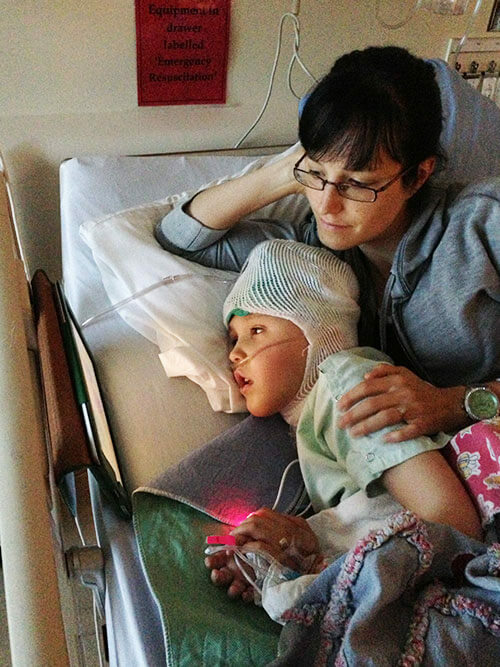 On March 11, Clare had her first major surgery, a skin graft. Other than her severe reaction to morphine, the surgery went well. After she recovered, and we finished all our training on how to feed a child through a nasal tube, Clare was discharged and we were finally able to take our baby home. She was a very sick, medically complicated, and unsettled little girl. We were happy to be going home, but we were extremely overwhelmed. I remember thinking now we were okay. We were out of the hospital. Our family would be together and everything would be fine. Unfortunately, that wasn’t the case. The next few years brought: severe reflux, at least weekly nasal-gastrointestinal tube changes, often in the middle of the night after she had pulled it out of her nose while flailing because she was uncomfortable and upset, daily blood glucose testing and the poor sleep routines that accompany a brain injury. There were multiple trips to therapists and medical clinics each week often with “bad news” and new diagnoses that come with a medically complex child, the reappearance of seizures, the worst of which involved her not breathing for a minute or two followed by vomiting, aspirating, high fevers and hospitalisation. She had so many admissions to the hospital following emergency room visits during her first year, that we lost track after 100 nights. Oxygen generators and tubes snaking through the house became a new reality as Clare’s damaged lungs created a need for O2 to be given. In the spring of 2009, we discovered she was silently aspirating, inhaling food into her lungs, and it wasn’t safe to continue our work on oral feeding. The doctors completed her second major surgery putting a permanent feeding tube directly into her stomach and performing a Nissen Fundoplication, wrapping her stomach around her oesophagus to prevent vomiting. Although it had been a difficult decision to have the surgery, Clare’s health improved significantly. Her emergency hospitalisations decreased dramatically making life a lot simpler. One of the challenges with a child like Clare is that you don’t get a single diagnosis. The “names” keep coming. Her current list includes a perinatal acute ischemic stroke, brain damage due to oxygen deprivation before birth and a condition called demyelination. 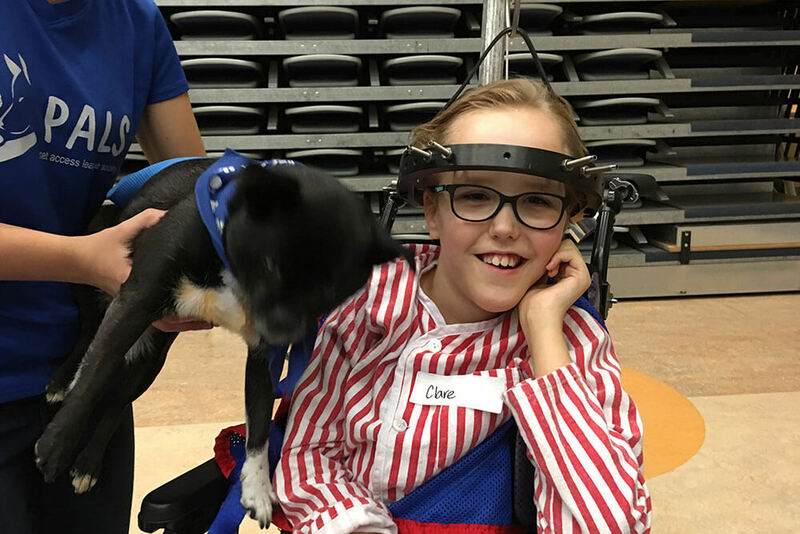 Clare has spastic triplegic cerebral palsy, epilepsy, severe global developmental delay, cortical visual impairment, scoliosis, bilateral hip dysplasia and Sotos syndrome. Clare has had 18 surgeries in her short nine years, with several combining two to three procedures. In 2013, she had a hemispherectomy, where the neurosurgeon severed all the connections to the damaged left side of her brain in an attempt to control her seizures. It was quite successful and now, with medication, she has very few seizures. Following that very serious surgery, Clare developed a grave infection that required three follow up surgeries to control. The purpose of the second operation was to permanently remove a large piece of infected bone from her skull. Six months of cautious waiting was followed by a cranioplasty to insert a plate into her head, replacing the infected bone that was lost in the prior surgery. The next issue was Clare’s rapidly progressing scoliosis. Clare’s curve was over 100 degrees and likely to get worse. The doctors usually like to put off spine surgery until children have stopped growing but it would be too dangerous to wait. Clare had rods placed along her spine in 2015. Over the next year and a half, she had nine more spine surgeries to address complications and infections. Clare’s case was challenging. Not only did she have severe back curvature, her neck was also curving forward. The pressure from these two curves caused the hooks that anchored the rods to pull right through the bone they were attached to. After this happened twice, her surgeon decided they needed to come up with a different plan. In late 2016, a new surgery occurred to remove the first rods and install a circular metal band, or halo to her head. A pulley system and 20 lbs of opposing weight was gradually added to the halo. She lived in the hospital for over three months while the weight straightened her spine enough so when they put the rods back in, the anchors would no longer pull through the bone. It was an exhausting and painful process for Clare and tested our family, but so far the rods are holding. Our days are unpredictable and busy. Our “normal” includes frequent hospital appointments, feeding pumps, physiotherapy stretches, ankle braces, standing frames, oxygen tanks, seizure medications, wheelchairs and aides visiting our house to work with Clare. It requires us to carry a 70 lb child up and down the stairs, around the house, and lift her in and out of the tub. We are currently working hard to develop a communication system that will allow Clare to more clearly let us know what she wants and hopefully reduce the frustration she shows during the day. Like all parents, we work each day to understand what our child is capable of and try our best to help her reach her potential. Life has never been easy for Clare, but with lots of hard work and the support of many therapists, doctors and loved ones, Clare has amazed us.